House with boarded windows and tarp on roof. After a building is damaged by a fire, wind damage, or other natural disaster, it is vital to secure the area with emergency boarding and tarping to protect the property from additional water damage. Wind damage can shatter windows and cause significant roof problems leaving a building vulnerable to roof leaking and rain entering through broken windows. Theft and looting can also occur if windows or doors are not properly boarded up after a disaster. When ServiceMaster by Marshall is contacted immediately, the chance for theft and looting is drastically reduced if not eliminated. One of the most important reasons for using our board up services is that if a damaged structure is not been boarded up, any further damage, theft, or injury claim could potentially be denied and become the financial responsibility of the property owner. 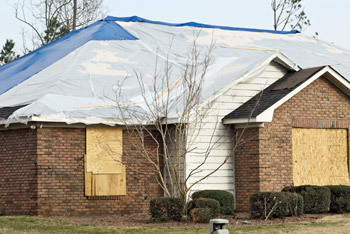 A contractor or insurance adjuster could take days or weeks to fix the affected areas. ServiceMaster by Marshall responds within 24 hours to secure windows and properly tarp roofs to protect your property until repairs can be made. If you are filing an insurance claim, emergency board up and tarping is most likely covered under your insurance policy; and a quick call to your insurance agent can confirm this. ServiceMaster provides emergency board up services for Columbus, Chillicothe, Circleville, Lancaster, Logan, Newark, New Lexington, Zanesville and all of Central & Southeast Ohio Counties.